After work I went up to see Laura's apartment in Harlem and chill out for some movie time. We had planned just to snack on some wine and cheese, but she was putting together a pot of THE soup as well, and I got very excited. 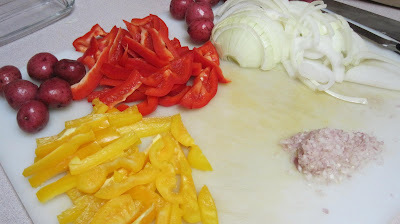 Not only was I going to get to taste THE soup, I'd get to see how to make it, from colorful start to delicious finish! Laura used a recipe from Great Soups. 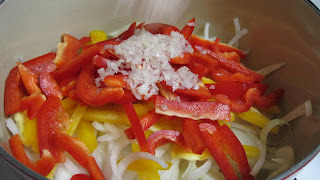 When I arrived at Laura's welcoming, spacious apartment, she already had the veggies prepared: yellow and red peppers, white onion, and shallots (Laura & garlic do not get along). 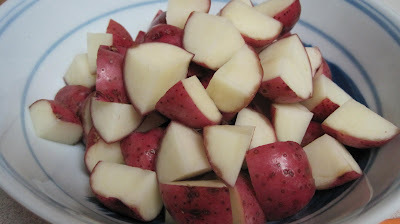 She also chopped up some baby bliss potatoes, cutting them in halves or quarters to achieve bite-size shapes. She added some olive oil to the bottom of her awesome Le Creuset pan and then poured in all the chopped veggies, which quickly set to sizzling and softening. It looked beautiful and smelled fantastic! We also added about 4 links of chorizo--yum! 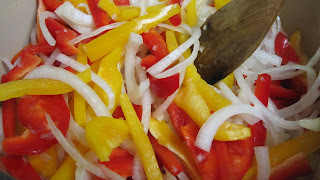 You could leave this out if you wanted to cut down on the fat (and some of the fabulous flavor, I think!) My job was to remove the chorizo from its casing and crumble it into bite-size pieces. I took that job quite seriously (chorizo shown pre-crumbling)! After less than ten minutes, when the veggies were softening and the chorizo was cooking more, Laura poured in the chicken stock. The recipe calls for 5 cups of chicken stock, but Laura puts 8 in--she says it evaporates too quickly otherwise. I'd say go with her recommendation, because there was NOT a lot of broth, even with the 8 cups used! 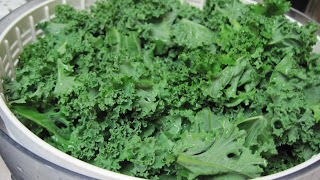 Then it was time for the super-star ingredient: curly kale. I was really nervous about trying this, because the few times I've had kale (usually sautéed in olive oil), I found it too bitter and just didn't like it. I was game to give it another go, however, and watched expectantly as Laura piled an entire colander-full of it (about 6 cups) into the pot. I wasn't sure it would all fit, but it cooks down just like spinach, and in a matter of seconds, it was all mixed into the flavorful, bubbling broth. 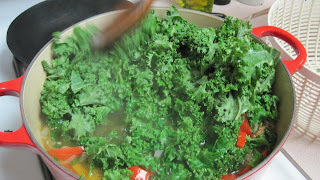 Once you add the kale, it only cooks for another 3-4 minutes and it's ready to serve! I tried a bite and instantly loved it. No bitterness at all, just leafy goodness with still a little bit of bite/crunch to it. Laura thought it might have needed more salt, but I thought it was perfect as is. 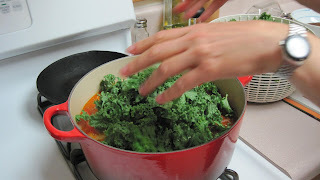 The kale gives it a very peppery bite, the veggies are delicious, and the soup is just very satisfying and scrumptious. It's hearty and filling without leaving you sluggish and stuffed. And it has so many ingredients that are so GOOD for you! me! Whatever! I ate the kale and liked it! Loved it!